(Nanowerk News) Developed by the folks at Party Robotics, Bartendro is a precision cocktail dispensing robot! It makes tasty drinks quickly and repeatably without the mess. It's light and portable so that you can easily take it to events, conferences, weddings, parties, or wherever. Bartendro 15 represents the company's flag ship drink bot with a carefully tuned drinks database it can make about 30 unique drink recipes. Depending on which liquids you choose, you could find quite a few more recipes. 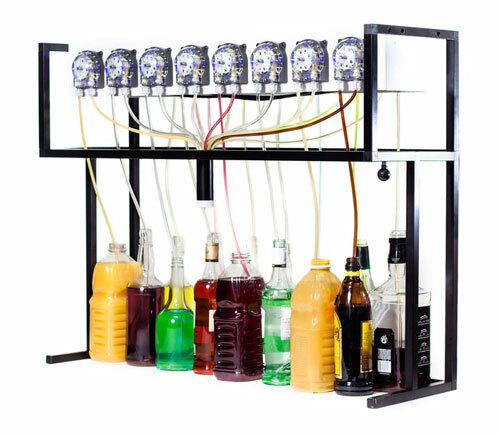 With 15 pumps you have the greatest flexibility of any of their bots and you can easily make it into a custom drink machine for your favorite party. If you like Margaritas you can load a few tequilas and a pile of mixers, letting users choose their favorite margarita type. Users can select their choice of tequila and then customize the drink to make it bigger/smaller, stronger/weaker or tarter/sweeter. Press the pour button and seconds later Bartendro will finish your drink. Check out the drink menu in advance on your smartphone. Bartendro is easy to set up and cleans up in about 5 minutes. Liquids only pass through food-grade tubing, not moving parts! Fill up a pitcher with warm soapy water and turn on the cleaning cycle. Run another cycle with clean water and sanitizer and the bot is good as new. Special admin screens let you manage dispensers, ingredients and drink recipes. This is where calibration, customization and cleaning take place. You can also view reports of the drinks made and quantities of ingredients used.